Want to be notified of new releases in SemanticMediaWiki/SemanticCite? Semantic Cite (a.k.a. SCI) is a Semantic Mediawiki extension that provides a simple way of organizing citation resources with the help of semantic annotations. Several short videos demonstrate "How Semantic Cite can be used or is expected to work". Semantic Cite does not require nor uses any part of Cite (or <ref>) as a means to declare a citation resource. The recommended way to install Semantic Cite is using Composer with MediaWiki's built-in support for Composer. Run the maintenance script "update.php" to ensure that property tables are properly initialized. A citation resource collects all structured data of a citation under one unique key that can be accessed through out the wiki and is created and managed by the #scite parser function. Citation resources (those created by #scite) can be added to a source page or any other wiki page each being identifiable by a citation key. 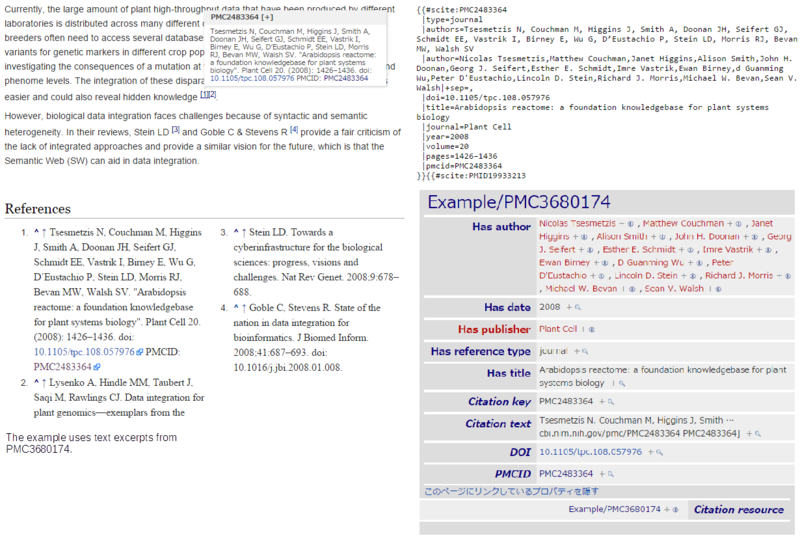 Above shows an example for a citation resource to be created by the #scite parser. More information about #scite can be found here. A reference list is automatically added to the content as soon as a Citation reference annotation is added to a page. The magic word __NOREFERENCELIST__ can be used to suppress a reference list from showing on an individual page while #referencelist can be used to position the list differently. More information about in-text citations and references can be found here together with a description about the usage of the #referencelist parser function. For questions about Semantic Cite and Cite, see the comments section. Special:FindCitableMetadata is provided as user interface to search, find, and map metadata with the #scite parser to conveniently integrate authority data from sources like PubMed or CrossRef. For more information, please read the search section. To change default settings, or add property mapping add text formatting rules, please read the configuration document.